There's little doubt that most humans today are better off than their forebears. 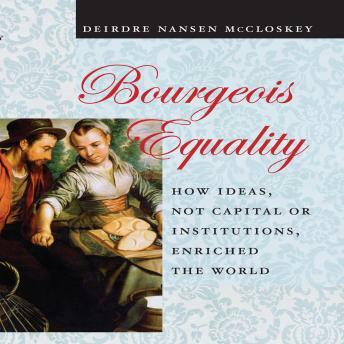 Stunningly so, the economist and historian Deirdre McCloskey argues in the concluding volume of her trilogy celebrating the oft-derided virtues of the bourgeoisie. The poorest of humanity, McCloskey shows, will soon be joining the comparative riches of Japan and Sweden and Botswana. Why? Most economists-from Adam Smith and Karl Marx to Thomas Piketty-say the Great Enrichment since 1800 came from accumulated capital. McCloskey disagrees, fiercely. "Our riches," she argues, "were made not by piling brick on brick, bank balance on bank balance, but by piling idea on idea." Capital was necessary, but so was the presence of oxygen. It was ideas, not matter, that drove "trade-tested betterment." Nor were institutions the drivers. The World Bank orthodoxy of "add institutions and stir" doesn't work, and didn't. McCloskey builds a powerful case for the initiating role of ideas-ideas for electric motors and free elections, of course, but more deeply the bizarre and liberal ideas of equal liberty and dignity for ordinary folk. Liberalism arose from theological and political revolutions in northwest Europe, yielding a unique respect for betterment and its practitioners, and upending ancient hierarchies. Commoners were encouraged to have a go, and the bourgeoisie took up the Bourgeois Deal, and we were all enriched. Few economists or historians write like McCloskey-her ability to invest the facts of economic history with the urgency of a novel, or of a leading case at law, is unmatched. She summarizes modern economics and modern economic history with verve and lucidity, yet sees through to the really big scientific conclusion. Not matter, but ideas. Big books don't come any more ambitious, or captivating, than Bourgeois Equality.